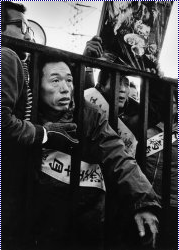 Minamata protestors at the gates of the Chisso factory. Minamata has become a word synonymous with disease. ‘Minamata disease’ was first identified in 1956, after years of chemical company Chisso discharging methyl mercury into Minamata Bay, Japan. It was a process that continued until 1968, and left over 2,500 people affected by mercury related diseases. Symptoms can range from ataxia, muscle weakness and damage to hearing and speech, to insanity, paralysis and death. In October, Minamata will be in the news again, when the first international treaty on mercury reduction, already agreed by more than 140 countries in Geneva, will be ratified. The treaty concludes almost a decade of work by the United Nations Environment Programme (UNEP) to limit the amount hazardous mercury in the environment. Minimata isn’t the only place to have experienced mercury poisoning. In the US, the neurotoxin has caused billions of dollars of expenditure on healthcare, causing up to an estimated 6000 heart attacks and 130,000 asthma attacks annually. It’s particularly acute in communities and cultures where there is a large consumption of fish – mercury bioaccumulates in fish and their predators as they move through the food chain. So close to source areas like Japan, eastern India and Uruguay are particularly at risk. How does it get into the environment? According to UNEP, in 2010 alone nearly 3000 tonnes of mercury were released into the atmosphere and water systems. Mercury enters the environment by all sorts of pathways – from chemical effluent, as in the case of Chisso, to its inclusion in household items like thermometers, cosmetics, antiseptics, skin lightening creams…. But two of the biggest sources are coal fired power plants and artisanal mining, together emitting around 1100 tonnes per year. Coal itself contains mercury, which is released when the coal is burned. 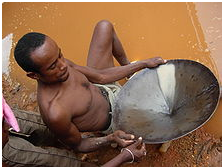 Artisanal gold mining involves using mercury to separate the gold from its ore. This forms a gold-mercury amalgam which is burned off with a torch. It’s simple, requires no training, and is relatively cheap. Mercury is tasteless and odourless, so when it does get into the environment it’s not easy to spot. The treaty comes after years of concern over the growing amount of mercury build up in fish and the environment. But does it do enough? For a start, it’s not legally binding. Instead, it encourages governments to set out strategic reduction schemes, on a facility rather than national basis. With current plans to build more than 1000 coal fire power plants worldwide, and mercury emissions not expected to fall until the 2020s, there are even concerns that the treaty could cause an overall increase in emissions – exposure rates would take several decades to fall, with the sheer volume of mercury in the environment. On top of this, it makes no provision for the identification or remediation of current contaminated sites or the payment of health damages – despite the thousands of people affected. 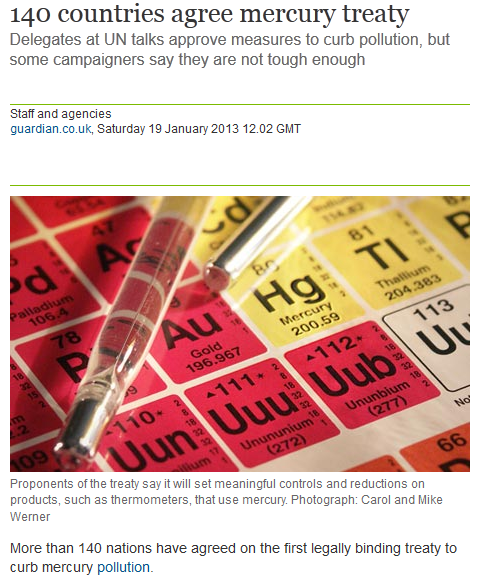 Supporters say that a complete ban on mercury wouldn’t work – it would only create a ‘mercury black market’. Instead, the treaty focuses on providing technology and information to those in informal mining, rather than setting unattainable or potentially immeasurable targets. And, though it’s been ratified, it’s not over yet – binding and voluntary approaches can still be added to the treaty in 2013. The main thing is to have a treaty which leads to an actual reduction in global mercury pollution. It needs to focus on cheap, non technical methods to introduce to the widespread small scale mining workers around the globe – the most unregulated and prolific supplier of mercury to the environment. UNEP are already discussing alternative cheap, basic separation processes such as a retort flask, to avoid the continued use of mercury. 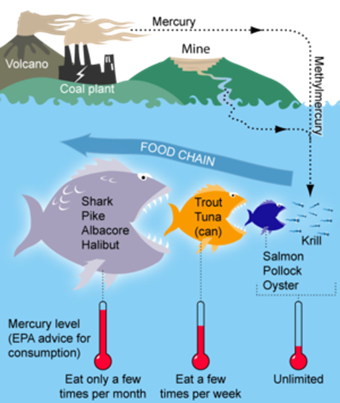 The problem of mercury pollution isn’t an isolated one. There are clear links with ongoing climate change and water scarcity – particularly the connection to coal fired power stations, with their high CO2 emissions and the significant amount of water they use for cooling. Many of China’s proposed new coal plants are in areas of significant water stress. Perhaps the answer is to approach mercury contamination from a broader perspective – combining the case for reducing the use of these power plants and mining techniques with wider issues of energy, water and food security. Tags: climate change, energy, environment, hazards, mercury, minamata, mining, water. Bookmark the permalink.